You’re about to see 40 half chickens, which were cut in half and still plenty of room on the Lang BBQ Smokers® 84 Deluxe model to accommodate four monster-sized ribs. As you’ll see in this video the Lang Smoker Cooker 84” is made to service large capacity cooking. Take a look at this video and you’re sure to get fired up. Both promise some mouth-watering results. Cooking at 225 degrees and just about to wrap the ribs, add brown sugar and a few more seasonings’ our host cool will then place them back on the grill for a few more hours for a juicy, tasty delight guaranteed to please. And with the large grill area on the Lang 84” a lot of people will get to enjoy the ribs and chicken at one time, no waiting to add more food to the grill. This video will get you cooking with the same level of passion that the cook exudes as he works the Lang 84” with a big load of meats. 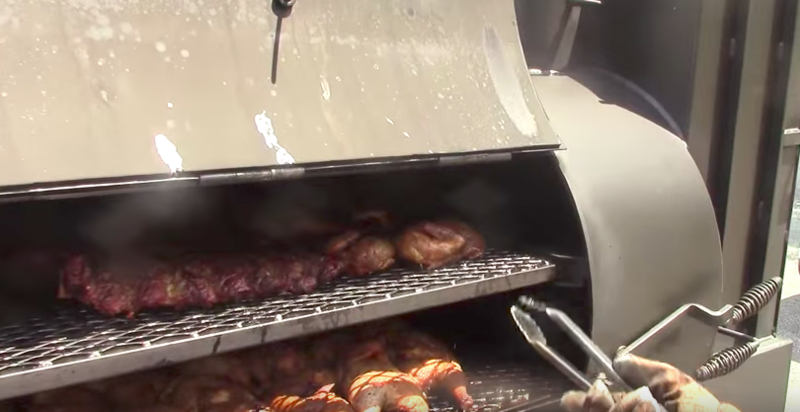 The 84” Lang BBQ Smokers® model is designed for large volume cooking with around 22 cubic ft. cooking capacity for commercial and competition use, as you’ll clearly see in the video. And 84’s come completely assembled, all welded and ready to cook. Could it be any easy to start grilling? Plus, all of the Lang Smoker Cookers 84” series models have a twenty-four inch, jumbo, reverse flow off-set firebox. But there’s even more standard features: Bar-B.Q. Heat gauge, No Flame Drip and Grease Pan, Flat Expanded Metal Cooking Grates on Square Tubing Frames (so they won’t warp), and removable and sliding racks to change the cooking space.